ESL is proud to once again sponsor the Rochester Red Wings! Professional baseball is a Rochester fan favorite. Learn more about the Red Wings. ESL is pleased to be the presenting sponsor of Fairport Canal Days, a fun and family oriented festival. Come and experience the beauty of the Fairport community May 31-June 2, 2019. 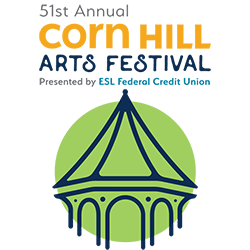 At ESL, we love the arts and the Corn Hill Arts Festival. That’s why we’re pleased to be the presenting sponsor of the Corn Hill Arts Festival on July 13 & 14, 2019. Geva helps us discover the power and joy of great theater. We’re proud to play a role in their success by co-sponsoring the 2018-19 Wilson Stage Season. ESL members receive a 25% discount for performances during the first week of each new show and up to a 15% discount on performances during the second week of each new show. ESL is committed to the success and growth of our community. A major part of that growth is continuing education. ESL is proud to offer two scholarships to individuals in the Rochester area. All of our [current branch count] branches make a vital contribution to the people and organizations in their area. Their efforts make a difference in their neighborhoods. As part of one of the most active communities in America for volunteerism, we’re proud to partner with News 10 NBC to recognize some of the most outstanding community service volunteers with the prestigious Jefferson Awards for Service.